Madrid is without doubt one of the best shopping spots in Spain and you could very easily shop until you drop here for several days. However, if you are looking to pack everything in to a day or so, here are some recommendations for a 24-hour shopping spree in Madrid. If you want to fit all your shopping into a day then you need to know what you’re looking for and plan where you want to get it. There’s a huge range of shopping options here, from markets and boutiques, to big shopping centres. Bear in mind that many shops close on Saturday afternoons and in July and August, a number of the smaller shops close completely. On Sunday, some of the larger stores open, together with some food stores and boutiques. Unless you’re going for high-end designer threads then prices in Madrid are very reasonable, particularly if you are used to shopping in the more expensive European cities. Madrid has plenty of the kinds of shops where you can pick up everything you could possibly need to buy in one fell swoop, which makes it the perfect place to head to for a 24 hour shopping spree. El Corte Inglés is a countrywide store and one of the biggest department stores in Madrid. Large and modern, with multilingual staff, air conditioning and very logically laid out departments, you’ll easily find everything you’re looking for here. 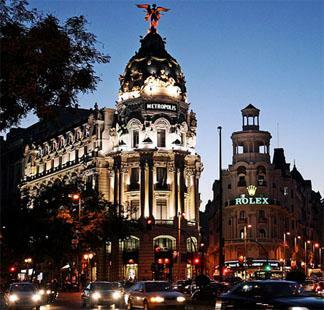 Most department stores in Madrid open between 10am and 9pm, Monday to Saturday. There are also a number of large commercial developments, like the Moda shopping mall and the La Vaguada, which is one of the city’s biggest malls and has everything from fashion outlets to department stores inside it. There are also large concentrations of shops like Zara, Pimkie, Bershka and Fnac around major streets in the city like the Plaza Mayor, Gran Via, Puerta del Sol and surrounding streets. If you’re looking for some glam threads, or the kind of little boutique stores where you can drop £200 on a belt, there are several areas of Madrid you should head for. Salamanca is the equivalent of Bond Street in London, with rows of lovely shiny designer stores and beautifully dressed sales assistants (expect a few snobbish looks if you show up in ripped jeans). If you want to head to Salamanca then look for these streets: Serrano, Velázquez, Castelló, Goya, Jorge Juan and Lagasca. Chueca is another area where the trendy and loaded come to stock up their fabulous wardrobes. Head for Calle Hortaleza if you are looking to shop in this area and if you want authentic boutique vintage then try the Fuencarral indoor market on Fuencarral street. Some of the shops near the university in the area of Argüelles – near Princesa and Alberto Aguilera.- offer some great bargains if you want to cram plenty of shopping into your 24 hour spree, without breaking the bank. Cuatro Caminos in the north of Madrid is also another great place to pick up a few bargains – between the streets of Bravo Murillo and Orense. ‘El Rastro’ market on a Sunday morning is probably the most famous in Madrid and has a huge selection of clothes, jewellery and trinkets. Make sure you leave a good couple of hours to get around it as there is so much there. If you’re looking for antique bargains then check out the Salamanca area, Huertas, around Calle de Prado, the Galerias Piquer in Puerto de Toledo and Nuevas Galerias. Amy is a guest blogger from Easyjet who operate flights to Madrid from London, Edinburgh and over 20 other airports across Europe.